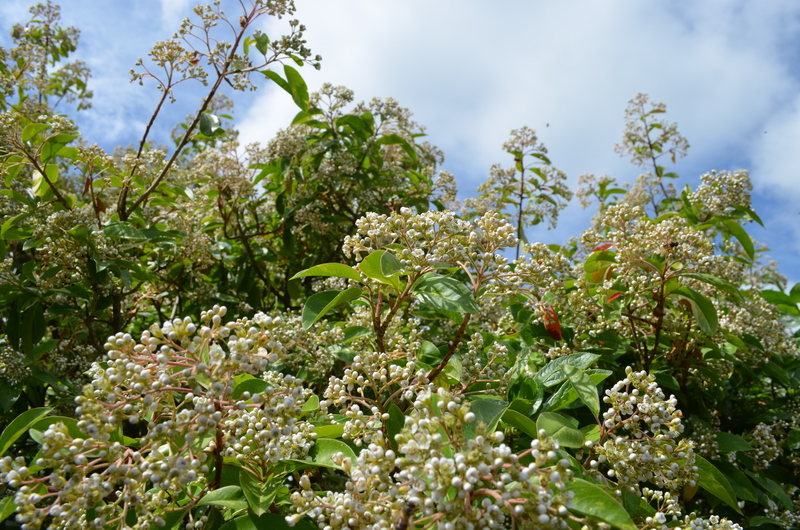 We have shrub in our garden – I think it’s a type of photinia – which, when it flowers, attracts bees like nothing I’ve ever known. The flowers are rather small and white-ish and give off an overpowering yeasty smell. Ioana finds the smell unpleasant and we call it the Stinky Bush (I quite like the smell). I was tempted to grub it out until we noticed how much the bees love it. You can stand underneath the dome of leaves and flowers (the bush is starting to take the form of a small tree) and imagine you are in the midst of a humming beehive. The sound is as powerful as the smell – you’d think that an entire hive was swarming. Tiny white petals speckle the path. It’s in flower at the moment and several times today as I’ve passed to and from my shed I’ve stopped under the Stinky Bush and enjoyed the sight, sound and smell. Most of the bees are honey bees, but I’ve also spotted several types of bumblebee: tree bumblebees, garden bumblebees and one buff tailed bumblebee. (We have a poster with different types of bee in our sunroom, and I’ve been trying to learn the different types). There is a female blackbird in our garden which has become quite tame. I think it might be a youngster. Today, as I was doing some DIY work in our living room, the bird came in through the back door into the room. It pecked at the crumbs the kids had left and didn’t seem unduly fazed when I moved quite close to it. Later on, I spotted it further into the house, in the hall. I assumed that was as far as it went, but much later on Ioana found it trapped in our bedroom. It had pooed on our bedspread, on some of Ioana’s paperwork, on the floor, on the bedside table, on the windowsill and on the landing windowsill. The poo stained the paintwork berry black (or insect black). I cornered it on our bedroom windowsill and caught it. When you hold a bird in your hand you are surprised how strong, light and lean they are. They feel like they are made of nothing but bones and air. A few weeks ago, I went for a walk quite late in the evening down the river Ouse at Poppleton, near York. I wanted to write a blog about it at the time, but never got around to it. I did take some notes, but they were merely a list of things I’d seen. So this is an exercise in trying to capture a memory that is on the point of fading. (I’ve been reading Norman N. Klein’s The History of Forgetting – which is about forgetting and Los Angeles – so the decay of memory is something that’s on my mind. Klein, in an appendix, talks about how the act of recalling a memory causes it to decay at a physiological level. A memory is altered each time it is recalled). The colour of the walk was undoubtedly white. How to describe the texture of the neglected strips of field nearest the river? They had something of the rough exuberance of overgrown industrial wasteland; a rich mixture of tough plants. Communities of plants in rapid flux rather than a stable, static mixture like you get in a mature flower meadow. A certain plant species takes over one season and throttles everything else: a monoculture. Then just as suddenly it retreats or vanishes altogether, to be replaced by something else, leaving swathes of dry stalks or seed heads. The shifting realms of plant species hide (and reveal) the human activity of working the soil beneath – ploughing, planting, reaping, driving vehicles, digging out drainage channels and water supply pipes and the like. There were whole massive swathes of dandelion clocks. Elsewhere there were thousands and thousands of groundsel clocks – tiny versions of dandelion clocks. The effect was surreal, somehow, like something from a twisted reimagining of a fairy story; something commonly seen but presented in an exaggerated, extravagant form. The may blossom (hawthorn) was out. May blossom seems to encrust the trees like plaster of Paris or coral; the heavy sprays of blossom resemble grasping calcified fingers. Fleshy closed fists of yet to flower hogweed were rising up among the cow parsley. White deadnettles were for some reason in abundance, especially along the top of the riverbank. Mealy white willow catkins polluted the air with fluff like asbestos fibres. Dried remains from last year: collapsed hollow stems of Himalayan balsam; reddish coloured tall stubble of something I couldn’t identify at the distance I saw it at; a crooked white stem of hogweed like the beckoning skeletal finger of an aye-aye. And then a white barn owl appeared directly in front of me about six feet above the path. It spotted me with its round black eyes at the same instant I spotted it, and it wheeled away immediately, as if stung. I watched it cruising this way and that over the far side of the field for quite some time. Then it rested on a branch at the edge of a poplar copse a hundred yards or so ahead of me. I could see the tiny white shape of it clearly, until I approached too close for its comfort and it flew off. (A few months previously, I saw what was probably the same owl, or its partner, in the middle of this copse, where a small iron footbridge crosses a stream. The owl flew out from under the bridge as I crossed it). When I had passed through the copse and out alongside a large field of light green barley, I saw the owl again. It was cruising again, over the barley, at some distance from me. It veered towards me and I thought it was going to fly right up to me, but, again, it suddenly spotted me and pulled itself to a mid-air halt and did an about-turn. I had taken it by surprise twice at about the same distance. I’d seen its small round human-like face fix on me twice. On the way back to the start of the walk, I had a photo in my mind of the skull of Thomas Browne, the seventeenth century author of a set of diverse and eccentric books which have a following to this day among writers I admire. Browne’s skull was stolen when his grave was accidentally disturbed in the nineteenth century and not reburied until the 1920s. A photo was taken of it at some point, which is reproduced in W.G. Sebald’s The Rings of Saturn, a book I’d just re-read (a book also about memory and forgetting). In this photo, the skull is viewed in profile, resting on three volumes of Browne’s work. The jaws are without teeth, giving it the look of an old man, and there is what looks like a twisted piece of wire holding the jaws slightly open, as if Browne is speaking. The skull has thoughtful cast to its brows.